These versatile, ready-to-use inks are ideal for silk screening, stenciling, and block printing. All colors are intermixable and can be thinned with water. Though heavily pigmented, Versatex will not change the texture or softness of the fabric being printed. Versatex semi-transparent inks are most luminous on light colored fabrics. Beautiful transparent overlays can be achieved with the use of a clear color extender. For permanency and washfastness, fabrics must be heat-set. These inks will not wrinkle or bleed on paper. For best results, use cotton rag papers suitable for serigraphy. Extender — Mix clear Extender with Versatex Screen Printing Inks to increase transparency without altering the ink's texture or consistency. Screen Life — Screen Life slows drying when mixed with Versatex screen printing inks. It preserves water retention to give you a longer working time when printing. Screen Life is especially helpful during long print runs or when printing in hot and dry conditions. It also aids in screen cleaning. Starter Set 1 — This set contains one 2 oz (59 ml) jar in each of eight colors, including Bright Red, Black, Brown, White, Yellow, Violet, Green, and Blue. Starter Set 2 — This set contains one 2 oz (59 ml) jar in each of eight colors, including Red, Orange, Scarlet, Magenta, Navy Blue, Golden Yellow, Sky Blue, and Yellow Green. 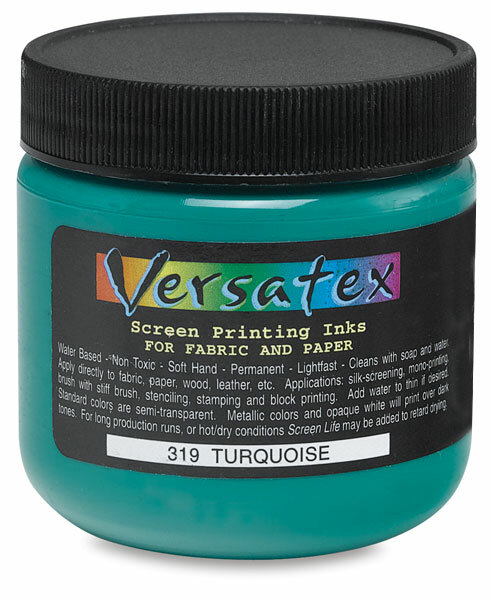 To view a PDF of instructions for Versatex Screen Ink, please click here.